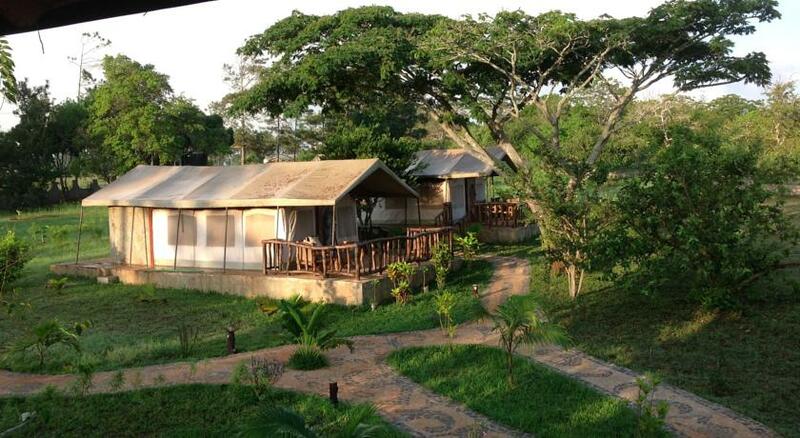 The Shimba Hills Green Lodge is located in the hinterland of the coast south of Mombasa, 450 meters above sea level, and is just over sixteen kilometers from the beaches of Diani Beach. And ‘situated on a hill crest overlooking the Mwaluganje Elephant Sanctuary , northern foothills of the Shimba Hills National Reserve . Shimba Green Lodge is situated on a Hill Crest viewing the Mwaluganje Elephant Sanctuary on the northern foothills of the Shimba Hills National Reserve (Safari Park) and just about 20 minutes from the Diani Beach. The Lodge is ideal to offer a relaxing holiday, which combines the refined comfort of the hotel and the excellent cuisine of the restaurant Various daily activities with excursions to neighboring parks, the beach and the nearby coastal resorts. At night the resort, immersed in a magical atmosphere, free from light pollution, allows fantastic experiences of astronomica. The resort, which enjoys a cool and breezy climate, has seven tented chalets in canvas, placed on the edge of the reserve in a lush garden, a large central hall with restaurant and bar, a delicious and inviting pool with Jacuzzi. Each Chalet is tastefully furnished in an ethnic style, and a bedroom area with king-size bed. The bathroom is furnished with a hot water shower and toilet facilities. Each has a spacious veranda with panoramic views and comfortable armchairs. Tented Chalets can accommodated two adults and one child under 12 years. Shimba Green Lodge can be reserved for private parties, wedding receptions, special anniversaries and birthdays. It also represents an ideal place for business meetings and for its unique location, is a perfect location for photo shoots and films. Already in 2007 the site was set of the movie “Piano, Solo” by Riccardo Milani, starring Kim Rossi Stuart, Jasmine Trinca and Michele Placido.